Kitchen cabinets blue may not be the first thought for your kitchen transformation! However, with the right contrast of colours, hand painting your kitchen cabinets blue can look striking! Kitchen cabinets blue ? May not be the first thought for your kitchen transformation! 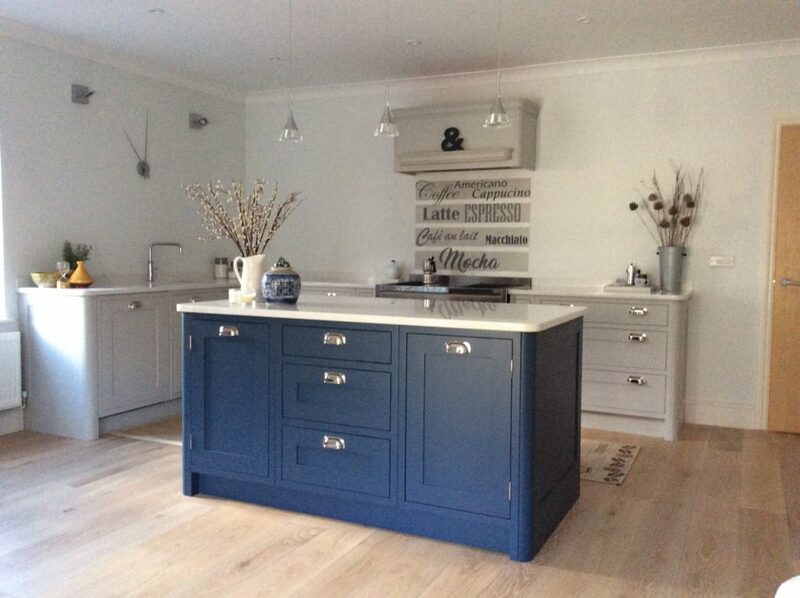 However, with the right contrast of colours, hand painting kitchen cabinets blue can look amazing! Back in May 2017, I was contacted by homeowner Jenny with regards to hand painting her kitchen cabinets blue. 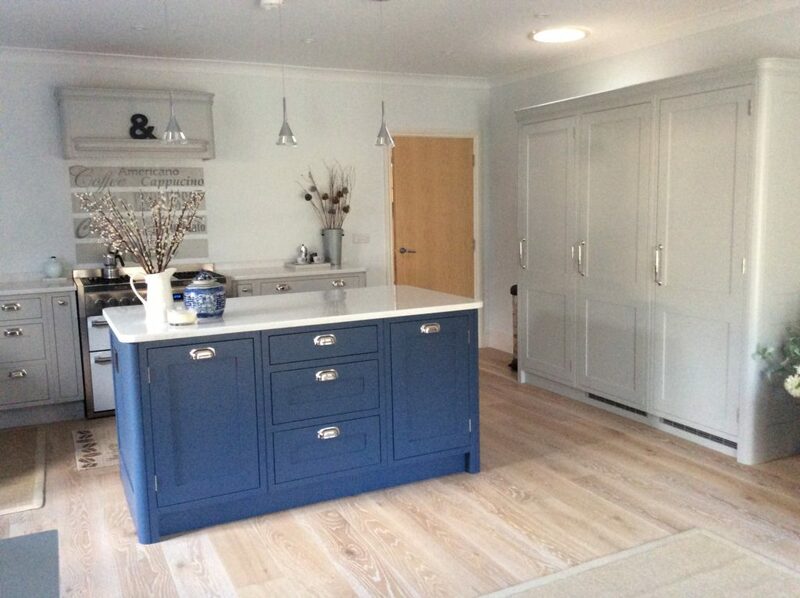 “Stiffkey Blue” was the chose of colour for this project in Retford Nottinghamshire. The kitchen was being hand made by a local cabinet maker and would be ready for hand painting in-situ around late July/Early August. Work began on 31st July and although the white granite work-surfaces were not yet fitted, this would not delay the painting process. The only obstacle was the newly installed flooring! Our standard preparation process is to cover and protect all surfaces that do not require hand painting. Heavy duty grade lining paper covered the flooring and masking up around end panels (the kick boards were removed). Jenny had chosen two colours from the Farrow & Ball Colour palette. Although I wouldn’t use this brand of paint for hand painting kitchens. I was able to get the equivalent colours matched into the specialist furniture paint I use. The equivalent to “Pavillion Grey” was used for the main kitchen units and a striking “Stiffkey Blue” on the central island. 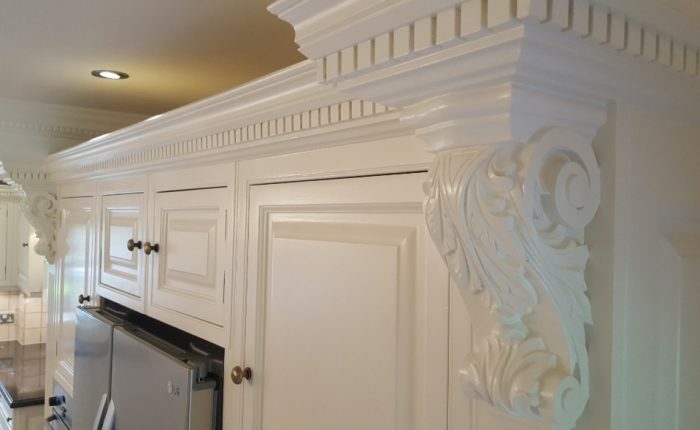 The contrast with the white granite tops was amazing! The sign written splash-back was another great idea from Jenny. She instructed the services of a local sign writer. Jenny has a passion and flare for colour and design. She has also up-cycled several items of furniture over the years, but when it came to her kitchen, she opted for the services of a professional kitchen painter to carry out the work. 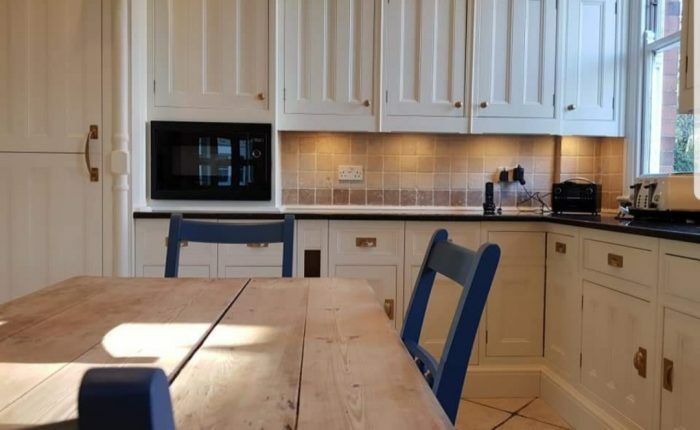 I specialise in hand painting kitchens in Nottinghamshire, Derbyshire, Leicestershire and South Yorkshire and various other parts of the UK. 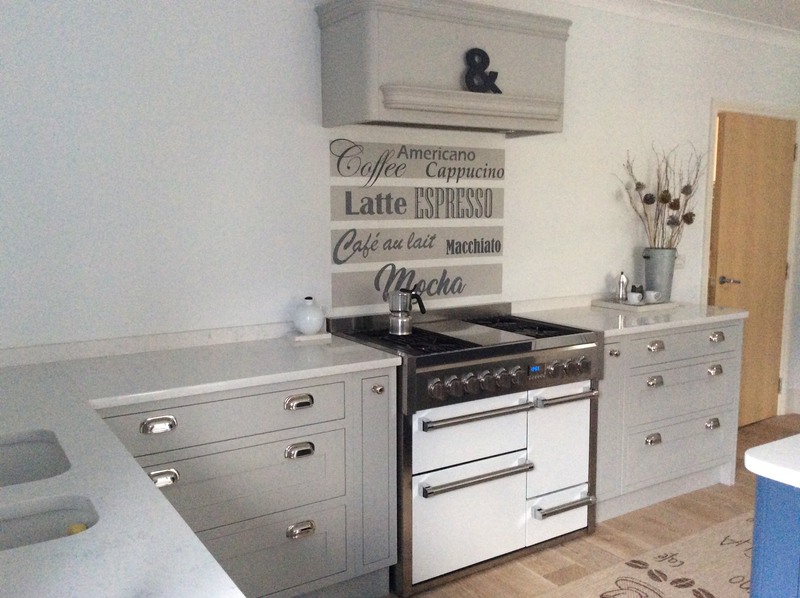 If you are considering having your existing kitchen hand painted or have a new installation you require painting, please do.